The wordsnSync EditTools Datasets are starter datasets in three fields: Drugs (1800+ entries), Organisms (450+ entries), and Journals (2100+ AMA style and 1650+ APA/Chicago style entries). The datasets give you a quick start toward creating your own comprehensive datasets. They are not comprehensive datasets themselves � they are starter datasets. 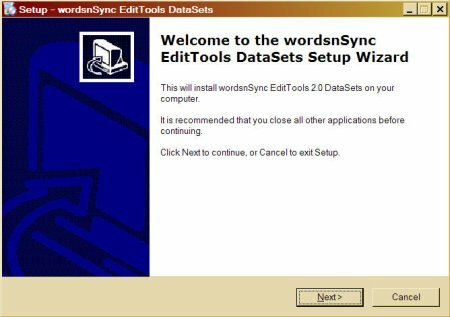 Note: Installation of wordsnSync EditTools Datasets requires that EditTools be already installed. Installation of wordsnSync EditTools Datasets is easy. Just follow these steps. Download Datasets.zip to your desktop. Unzip the file and place wordsnSync EditTools Datasets.exe on your desktop. before installing the new datasets. So you don�t need to worry about losing any of the data you may have added to Never Spell Manager during the trial period. Double-click wordsnSync EditTools.exe to start the installation Wizard. Click Next and the Wizard will guide you through the installation. When the installation process is done, you will see the screen below. Now you need to merge your datasets with the data of the newly installed datasets. Unfortunately, there is no easy way to do this; it has to be done entry by entry. The first step is to open your original datasets that were saved before the new datasets were installed. Only four files are of concern: ns_org.nsw, ns_drugs.nsw, pubmedjournals.jnl, and apajournals.jnl. The process is the same for all, so let's use ns_drugs.nsw as an example. As shown in step 2 above, our Drugs tab had Zomig in it. Let's add Zomig to the new datasets if it is not already there. First, go to C:\Documents and Settings\computer name\My Documents\EditTools and double-click on ns_drugs.nsw to open your original drugs file in Notepad as shown here. Next open the Never Spell Manager from the toolbar (Never Spell Word > Never Spell Manager). 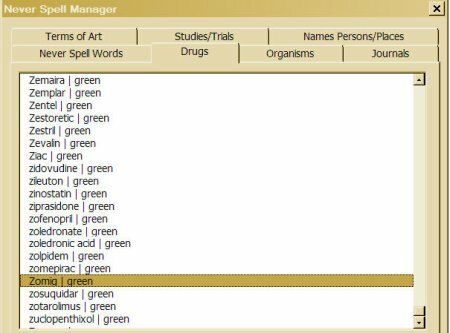 Select the Drugs tab in Never Spell Manager and scroll down to the Z entries to see if Zomig is present. Because Zomig is not in the list, we need to add it. There are two methods available. You can either (a) copy and paste or (b) manually enter it. To copy and paste, return to the open ns_drugs.nsw file, select Zomig (but not the space nor any other information following the drug name), and copy it to your clipboard. 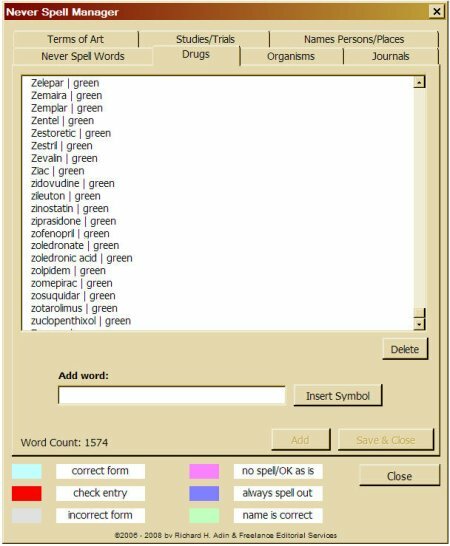 Next go to the Drugs tab in the open Never Spell Manager and paste Zomig in the Add word field (shown below). To manually enter it, simply go to the Add word field and type Zomig. Click Add. If you have more than one entry to add to this particular tab, add the additional entries, then click Save & Close. Caution: You cannot add entries to more than one tab at a time. When you are done adding entries to a single tab, click Save & Close. Reopen Never Spell Manager to add words to another tab. If you try to add words to more than one tab without saving, only the entries made to the last tab will be recorded. Only one dataset can be accessed at a time. When you reopen Never Spell Manager and review the Drug tab, you will find that Zomig has been added to the dataset. Repeat steps 6 to 9 for the three remaining datasets. Installation and merger are complete. We hope you find EditTools and the EditTools Datasets helpful. If you have any suggestions for additions or improvements, please let us know by writing us at service [at] wordsnSync.